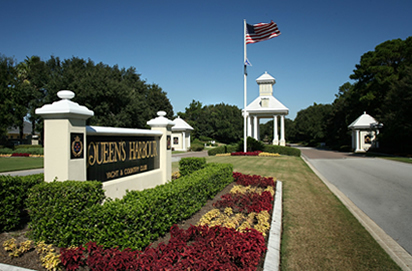 Queen’s Harbour Yacht and Country Club is a gated community unlike any other in the world. Natural beauty abounds as landscaped homes are nestled among towering oaks and palms separated by wide-open, green spaces and a freshwater lagoon. The community is bounded on three sides by the St. Johns River, Greenfield Creek and the Intracoastal Waterway, providing beautiful waterfront vistas and exceptional access to navigable water. The country club offers world-class golf and dining facilities. Its Clubcorp membership provides reciprocal privileges to members with access to over 200 clubs, resorts, and spas globally. Queen’s Harbour is a Jacksonville waterfront community that is second to none and it features some of the most exquisite homes in Northeast Florida. Most homes within the community are nestled between decades-old oak trees and winding waterways that connect to the Intracoastal Waterway. Imagine parking your yacht in your backyard in the safety of a private, freshwater Jacksonville marina with its own lock system. Or you could enjoy a challenging golf course and professional tennis facilities within walking distance. Whatever you and your family want to discover, your home at Queen’s Harbour Yacht and Country Club will broaden your horizons.